Unfortunately it does not work for me :(I mirrored a front part in the VM because I want to print the front part as a whole. Now the Kurfs are going in the wrong direction and I can not take the detail out. The direction of the curve can not be changed. Do you have a suggestion how to get a good result without redrawing the curve? 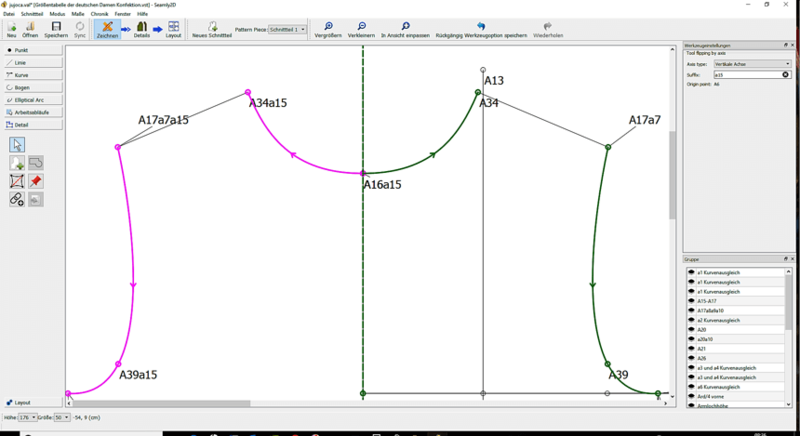 Hi, when you want to select a curve going in the wrong direction, you have to press shift when selecting that curve. Like AVI said - select point A34a15. Select, pressing shift, the spline. Select A16a15. Select the spline. Etc, until the detail is finished. Whenever the dart shows in the wrong direction, press shift, this reverses the curve. The curve was a reflection over an axis. You do not see them alone but always with the complete mirroring. I think you just have to redraw it. It works with mirrored curves, I made a little video.